Scorpio could be considered as the Faustian creature struggling for getting to the bottom of things – never getting satisfied as well. She may love her demons, but she might detest them as well. She represents the fighter of both sides: her occult and passionate compulsive side. 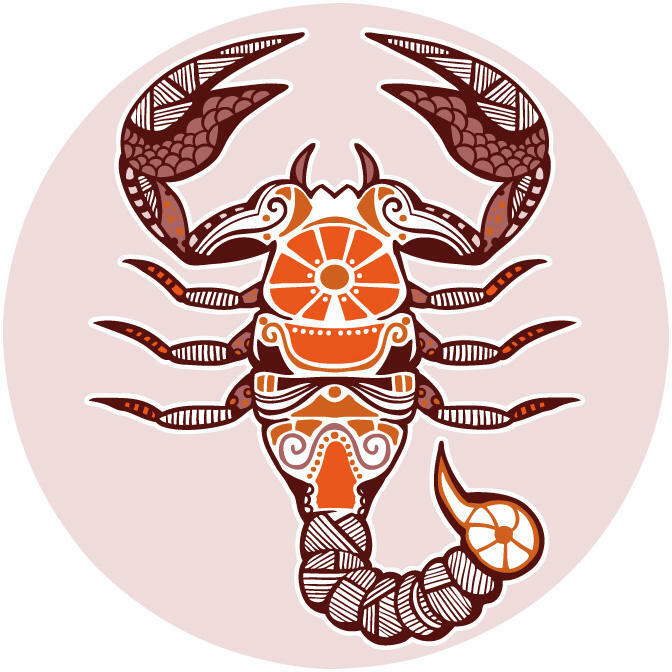 Scorpio’s patronizing planets are Mars and Pluto – with all their significant energetic aspects - drama and seduction - rigour against herself and tendency to intransigence. Scorpio’ legendary passion and sexual attraction means a lot to her - and to her surroundings. Some characters should be mentioned in this tale: male characters like Alain Delon for e.g. Just remember and imagine by what sort of intensity and hypnotic effect he had given when he exposed his thinking. No matter whether you are male or female – you get a bit nervous of a vague way. Fascinating and challenging state of mind in the faces expressions – that shows the reason why you may feel this way of uncertainty and captivated. Similar fascination and piercing glances… Pablo Picasso represents another male Scorpio and now some Scorpio divas appear on the stage: Vivian Leigh, Katherine Hepburn and Grace Kelly. All reserved ones with expectant and exacting requirements. Without ambition and struggling you would have never seen Madame Curie and Indira Ghandi - therefore policy and politics are called their subject. However, they were and they are inconvenient contemporary – and good observers. Although they offer(ed) an extraordinary media presence they are reserved and closed persons…they are opponents somehow and as representative of a water sign they fulfil this kind of spirit generously. When they show those extroverted facades and nothing more: Suffering from the loss of glamour or popularity… or success. The state of health means another main topic in their lives. They like to go to the limit – and later they consider it would have been their limit – despite all spirit and limitation – and frontier spirit as well. Pioneering and handling love matters – what could Scorpio better be characterized? Possession and passion: regarding love relationships and love affairs the biggest thing. Devotion and commitment - voluptuousness is what Scorpio is longing for or better said: it is what she demands. Her choice to select her partner based on a strong instinct – her strong accuracy and finally her strong will to succeed whatever she wants. Her ideal finding her great love is accompanied with the strongest desire of possession – and control. Jealousy or the will to control leads often to intransigence and even cruelty…pain in the end – it is what might happen - on both sides within a love relationship. Scorpio is quite self-confident. Scorpio appears self-confident – maybe overconfident or how to say… restraining her opinion would present an impossible fact – without any doubt. And she would never leave a path of her made decisions – because it is hers. Herewith do you exactly come to know and must learn what characterizes Scorpio’s nature at its best. The issue to commend praise would never slip away - considering self-control and individual concerns… Being careless and thoughtless is to be considered beneath her dignity- controlled free falling, But it must be recognized as a must and living example of fascinated contradiction. When push would come to shove she would have to cut – inevitable even herself, but others, too. Fortunately Scorpio can develop and is also able to spare – mercy and grace by her enthusiasm for death and life. Fatal: Scorpio has such a big amount of energy! Amiability is hers when she feels compassion – and for the weak… Scorpio could develop not only braver – it would not be required, but wiser and calm. Fairness would become the social issue – against passionate triumph - fear: not at all, for Scorpio no reprimand. Those who have Scorpio as a friend can always rely on her loyalty and truthfulness. Scorpio’s nature implies accuracy and memory: for better or for worse. She would never ever forget a gift or a present – all her life – at least… Scorpios believe in fate – but they take their destiny in both hands: hungry for life and love – she would never regret any mistake – if any aims in life would fail she chose another or others. Regarding health, as it is already mentioned in this text, she keeps on the border area – it would be described the perfect standard: during some phases or period Scorpio acts throughout regardful - but it must be neglected one day again. Most of all they have a robust state of health. She has a strong faith – it could contribute the recovery – with consideration of each personal state and individual situation. Scorpios have a strong faith – religion, system, social conviction, and ambiguity. Life and death are meeting in the sea of questions and exploration – fathom out the occult, but sharing the bright side as well. The phenomenon of living and dying – the circle includes all. Challenges, changes, and drifts – for her beloved family she would always be heroic… Regarding her nature it is repeated once again Scorpio desires... she desires for love and for possessions. When the time is right she cuts – to restore things or to renew any situation Circumstances and conditions: who needs it most? There might appear a mysterious force that may guide her – to wherever she wants to be bound. She can fulfill her wildest dreams – given by her very own persuasion and belief. In a positive sense or in a negative manner: hop or drop – that’s the way she ticks. Her empathy for creatures or humans might give her extraordinary – maybe marvelous talent to see. Secrecy and mysteries are basically inevitable attributes or companions in her lifestyle. }She is an actor, a jouster and a jester – and when a conclusion is drawn for instance: she is a queen. Endurance, stamina, for obstacles there would be no room – to cause harm is one almost unpardonable sin for Scorpio. Scorpio frees herself from cages. And - as already mentioned: she could do some harm to herself. From saints to sinners – anything goes - she is talented and she knows! She is the composer – and the author. Numerous stories could have been told and it could be continued.